Confidential sources close to San Francisco City Hall told Towleroad's Corey Johnson that the California Supreme Court was prepared to release its opinion on Proposition 8 tomorrow, but decided to delay the ruling after a call from Mayor Gavin Newsom. 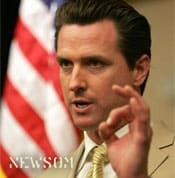 "Newsom reached out to the Supreme Court and asked them to hold off releasing their decision so it did not coincide with the White Night riots," said our source. UPDATE: Towleroad received this tip from a highly credible source who did the interview on the condition that they remain anonymous. We have been working to get additional sources. Gavin Newsom's office has issued a release denying the story. San Francisco Supervisor Bevan Dufty spoke with Towleroad late this afternoon, saying he doubted the claims. Said Dufty: "It is implausible if not impossible to imagine that the Mayor could reach out to the California Supreme Court. Any thinking person would know that he would be radioactive to the justices given his leadership on the issue. His father is a retired federal judge. The Mayor's courage on this issue is unimpeachable. He would not intrude in what we've been waiting for."